I changed things up a bit today and will post the iPhone photo at night instead of in the morning. I was very excited about the Lincoln shot so I wanted that to post early in the morning. Tomorrow the Purdue football team will play Illinois in Champaign. I have been to the stadium twice now, and each time was a challenge. They do not allow “professional” cameras in the stadium. I always get a kick when cameras are labeled professional. On my first trip I went through security, had my ticket taken, and then someone tried to tell me that I couldn’t have my camera in the stadium. I guess I was supposed to buy a new ticket to get back in. For some reason they really have it out for people who want to take a picture. That lesson helped me get in two years later when I knew the rules, and I came up with a plan to get my camera in. I will have more on that in a later post. 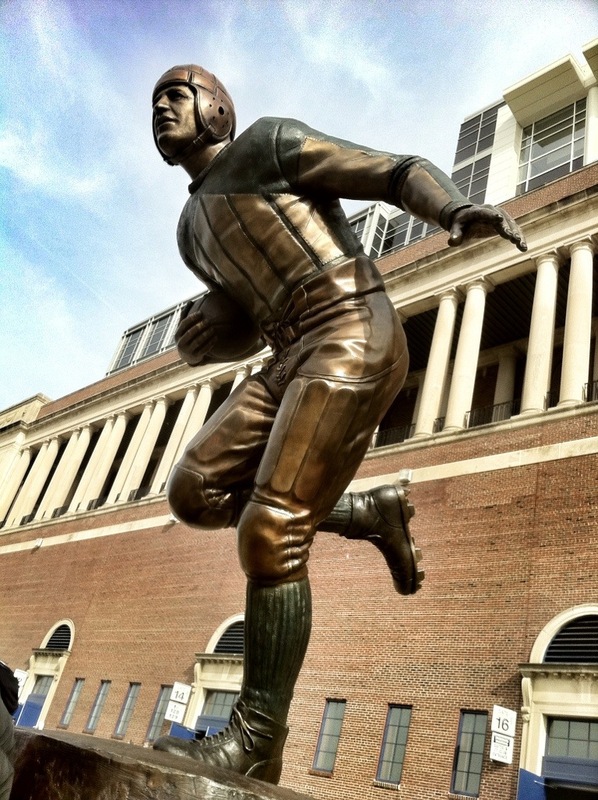 On my way into the stadium I saw this statue of Red Grange outside of the stadium. I did not want to blow my cover and get my dSLR out to get a shot of it so I grabbed my newly acquired iPhone 4 to get this shot of it. It has pretty much just sat on one phone or another since that time, but now it finally made its way off of the phone. That is the problem with iPhone shots. They seldom find their way off of the phone. I decided to run this photo through Snapseed to see what I could do with it. I did get some of the color back in the sky that my iPhone couldn’t show me, but I did get a lot of noise in the process. I could have not fixed it that way, but I thought that the effect was worth the price. I also played around a bit with iPhoto to get the shot from my phone to this post. I can see where it could be useful, but it is another step in the process.